E-cigarettes all work in basically the same way, whether they’re cheap disposables, “cartridge” units which resemble a tobacco cigarette, or more complicated tank/EGO systems or personal vaporizers (PV). Looking more closely at the design of electronic cigarettes can help you understand why they’re so different than the regular cigarettes with which you’re familiar. For starters, there’s no tobacco in e-cigs, and the contents aren’t wrapped in treated paper. Nothing is burned inside; instead, liquid ingredients are heated to create a vapor that is inhaled by the “smoker.” The modern electronic cigarette has three basic features: a power source, an atomizer and liquid (usually called e-liquid) inside a container and delivery system. The simplest rechargeable models use a disposable pre-filled cartridge which is thrown away after the liquid is used up, although some companies offer the option of blank cartridges that can be refilled with e-liquid; the power source is the only component that is reused. In tank or PV units, the components are reused multiple times. As you would probably guess, electronic cigarettes must have some type of power source. It’s usually a rechargeable battery, which is inside the long component of most e-cigarettes – the part that looks like the “tobacco” end of a regular cigarette. This is the heaviest part of an e-cig. In most cartridge ecigs, the battery is activated when the user starts to inhale, providing power to the atomizer. On higher-end units, as well as a few cartridge models, the user needs to press a tiny button to activate the battery. This takes a little getting used to, but it also allows the vaper to take a longer inhale than the five seconds that some units allow. Batteries with variable power options are available for PVs (also known as mods), allowing experienced users greater control over the vapor that’s produced. In traditional rechargeable e-cigarettes, the atomizer is built into the disposable cartridge along with the e-liquid. The design of the atomizer in tanks and mods varies by model, but it’s a separate reusable component. They work in basically the same way, however. There is a wick (usually made of silica fibers, but sometimes made of hemp, cotton or a stainless steel mesh) which draws the e-liquid up from the container. Then a heating element powered by the battery “atomizes” the liquid, turning it into the vapor that’s inhaled. Accomplished vapers or hobbyists who use personal vaporizers and are purchasing an atomizer (the atomizer usually comes standard in a tank starter kit) need to consider two simple electrical measurements: the voltage output of the battery and the resistance inside the atomizer; the right combination creates the right level of vapor and avoids the “burned” taste that sometimes results from too much power or too little resistance. Variable-voltage batteries are the easiest way to accomplish this; there are also charts available online that list the optimal voltage for the resistance of each atomizer. It should also be noted that atomizers (unless you’re using a cartridge system) do occasionally wear out and need to be replaced. The component which may be most important to a user is the container, because it holds the e-liquid – which determines the way the vapor feels and tastes. The liquid is primarily a base of either propylene glycol or vegetable glycerin (or a mix of the two) with flavorings added to it. The varying of flavor agents creates the taste of a tobacco or menthol cigarette, or one of the savory or fruity flavors that are also available. The manufacturer usually adds nicotine to the solution as well. There are various concentration levels available, from ultra light (with very little nicotine) to extra strong (equal to the level of nicotine found in non-filtered cigarettes). 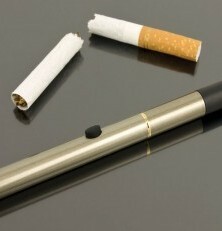 Most companies also offer a no-nicotine option. E-liquid is already included in one-piece disposable e-cigarettes, and in the cartridges of traditional systems. For tanks and mods, the liquid must be poured into the tank made to hold it. Some experienced users enjoy buying different flavors of eliquid and mixing them to create their own unique flavors. It is less expensive to buy e-liquid than pre-filled cartridges, but many vapers find it less convenient to constantly refill cartridges. That’s the primary reason why the simple two-piece units used to outsell more complicated designs by a wide margin. However, as the electronic cigarette market begins to mature, tank systems have become more popular than ever and are cutting into sales numbers previously dominated by cartridge ecigs.